There is quite a lot of talk about preaching and relevancy these days. Much of it simply buys into the whole revivalism and numbers game seen in many fantastical fads and gimmicks over the past few decades. Even given so much progress in education and learning styles in recent decades, there is a very real danger that the act or art of preaching could succumb to an overbalanced bias to the felt-needs of the listener, i.e. if the prop or story or illustration or picture wasn’t good enough, the sermon was rubbish – as if! I’m not sure when Jesus preached the gospel, he was concerned with people “getting it” so that they went away pleased, comfortable….the same. And yet, Jesus is the supreme communicator, whose parables are the prime example of cultural relevance. Those who did actually “get it” had their world turned upside down, their ego’s shattered, and their hearts strangely warmed by a God who was suddenly a lot nearer than they had even dreamed or imagined. Contextualisation and cultural engagement are of course important; yet there is something sinister when preaching is merely defined this way: sinister because in the drive to make preaching snappy and ‘relevant’, something of the gospel’s own inscrutability is lost. If the gospel is meant to be preached and presented with such clarity, then why didn’t the disciples understand so much of it? “Why are you so dull?” is one of the most serious and comical aspects of the gospel accounts! The real key, is to understand properly what genuine relevance is: our alienation from God and what God has done and is doing about it. 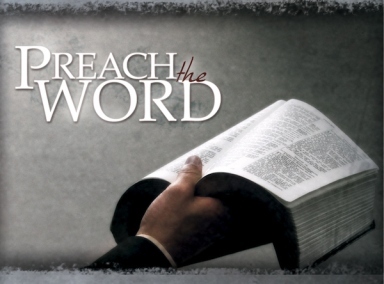 Preachers must preach the gospel, with a bible in one hand and a newspaper in the other, that’s for sure, but God’s Word is relevant in itself. It is this God-inspired text that interprets our world and us as of first priority, and only the other way round as a second priority. Preaching is not the rather amusing accusation of being a monologue by a moron to mutes! As I shared with my church last year, “I’m not a moron!” Preaching: faithful, biblical, Christ-centered, is the means of hearing God afresh in our day and having what we believe, live, see, feel and love, turned upside down and transformed. We live in a strange world, but we are called into the strange world of the Gospel. And in faithful preaching, God takes this meagre offering and somehow, does something with it.